Season the pork loin with olive oil, salt, pepper, herbs and crushed garlic. Let the roast sit in the fridge seasoned for 3 or 4 hours or overnight. Pre-heat oven to 400 degrees. Wash and peel potatoes and carrots and slice thinly. Toss with olive oil, salt, pepper, chives, shallots, herbs and surround roast with vegetables, drizzle with more oil and add rosemary and fresh thyme. Place roast and vegetables in 400 degree oven for 20 minutes and then reduce oven temperature to 375 and cook for 30 more minutes or until meat temp. is around 160 degrees. A quick word about Sorrel, which grows prolifically in the Spring in Normandy--it is somewhat like spinach or kale, but with a snappy-citrus 'bite'...my cher-father-in-law gave me about 2 pounds from his garden and this was my first go at making it! Chop the cleaned Sorrel and blanch in boiling salted water for 30 seconds. Saute to soften shallots, garlic, butter and a splash of olive oil, add heavy cream and simmer just under a boil to combine. Add blanched, drained Sorrel, and gently add cream fresh--until blended. Season to taste. Serve hot. Yum I wanna come to your house for dinner. 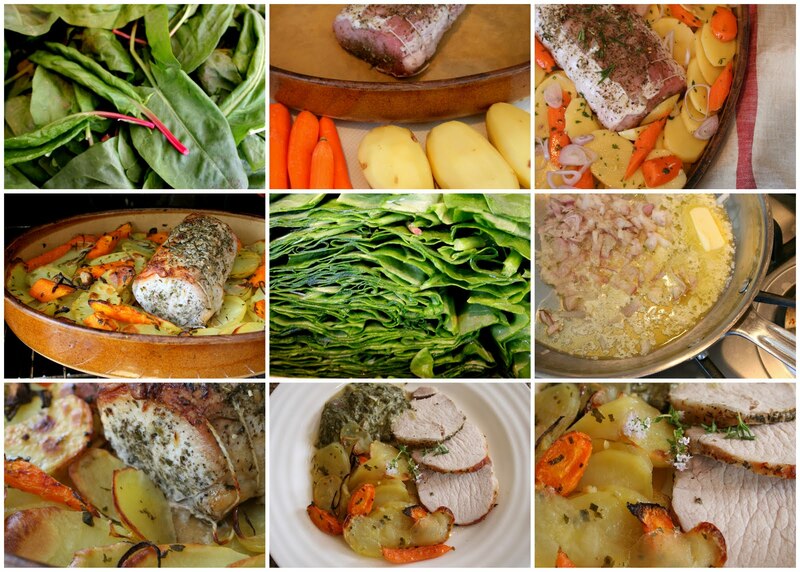 That pork and the vegetables look fabuloous. You are living my dream there in France. Food decor and family in a foreign land....what more is there.